Specialist card was added to the modules. 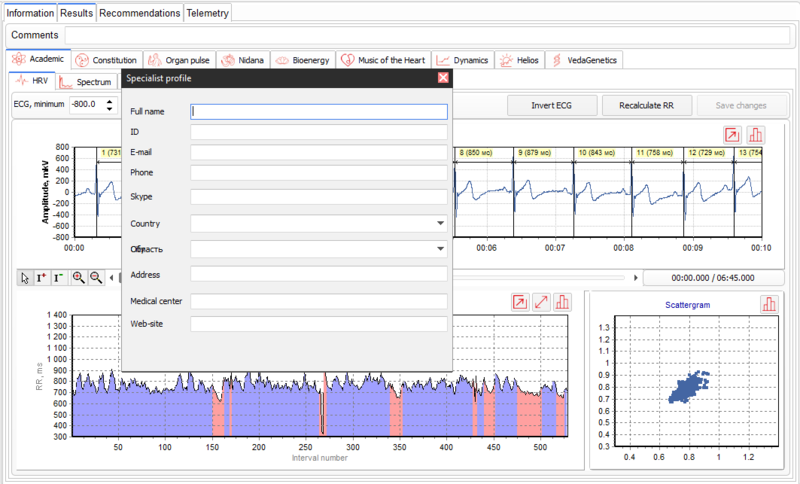 To start using the new features of the program, download the updated VedaPulse™ software . 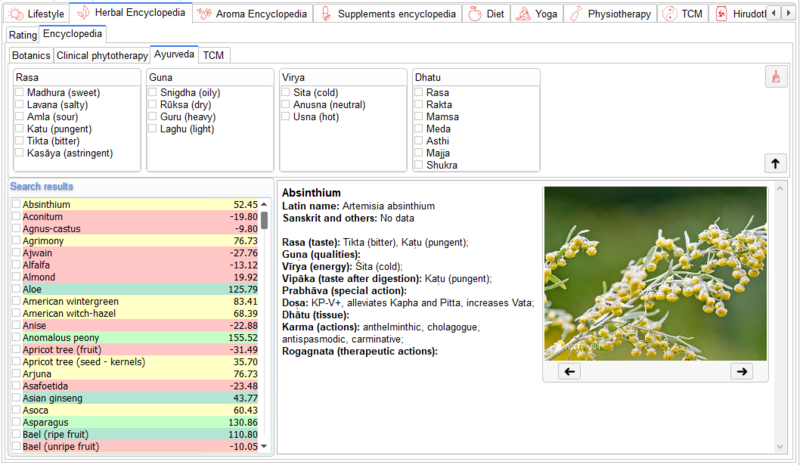 The operation of the new VedaPulse® software module Herbal Encyclopedia is based on mathematical algorithms taking into account the canonical description of medicinal plants from the position of Dravyaguna in Ayurvedic practice, Materia Medica in Chinese herbology and medicinal properties of the plant from the position of clinical Western herbal medicine and naturopathy. Thus, the module actually imitates the clinical reasoning of the herbal therapist. After 5-7 minute assessment of the heart rhythm on VedaPulse®, the specialist has the ability to generate an personalized herbal composition for the patient. Designed for creation of a personalized herbal composition based on the analysis of constitutional compliance as well as the strength and direction of the impact of the herb carried out by a specialist himself. A multi-level interactive guide that allows you to specify some medicinal properties of selected plants in the herbal collection based on independent analysis of the classification categories adopted in Ayurveda, TCM and Western clinical pharmacology. Gives an Ayurvedic description of herbs based on the analysis of canonical sources in Dravyaguna (Nighantu) and the expert recommendations of the Ministry of AYUSH; Provides the description of the Ayurvedic medicinal plants based on the analysis of the canonical sources of Dravyaguna (Nighantu) and expert recommendations of the Ministry of AYUSH. Provides the description of medicinal plants according to Chinese herbology (TCM) based on the analysis of the canonical sources (Yaoxing Lun, Ming Yi Bie Lu, Ben Сao Tu Jing, Ben Cao Gang Mu, Shen-Nong Ben Cao Jing, Xin Xiu Ben Cao and others. 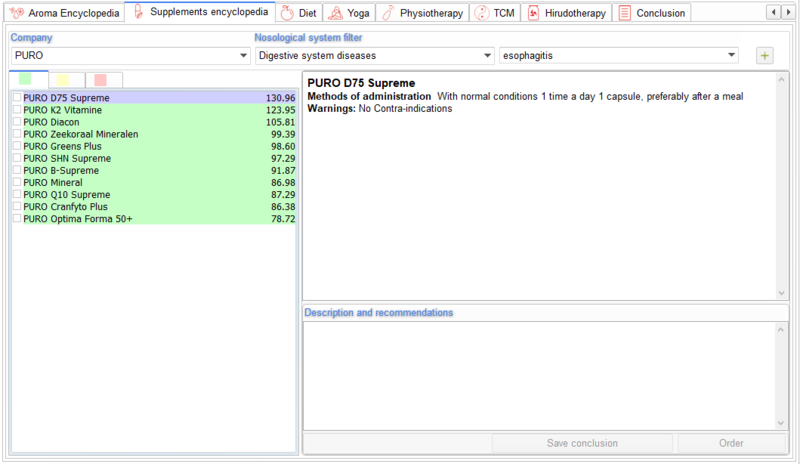 It is important to note that the heuristic algorithm of the module works on the principle of multiparametric criteria analysis, filtering the herbs across all three lists. There are several adaptive levels, on which the processes of the client’s physiological regulation can be maintained. Each level has its own requirements for the properties of herbs so that even constitutionally-suitable plants can, in some combinations, fall into the red list, that is the list of plants that are undesirable for use. Due to the recent software update of VedaPulse® it is now possible to save the personalized reports in the modules Lifestyle, where the report is based on 10 constitutional types, and Supplement Encyclopedia - the report is based on recommended dietary supplements. The reports have undergone major design changes and now are saved in PDF format. For more convenience, the top of the report now contains information about the patient, his medical history, and also the data on the specialist conducting the assessment, which can be filled in the corresponding fields of the tabs Information and Settings – Specialist Card. 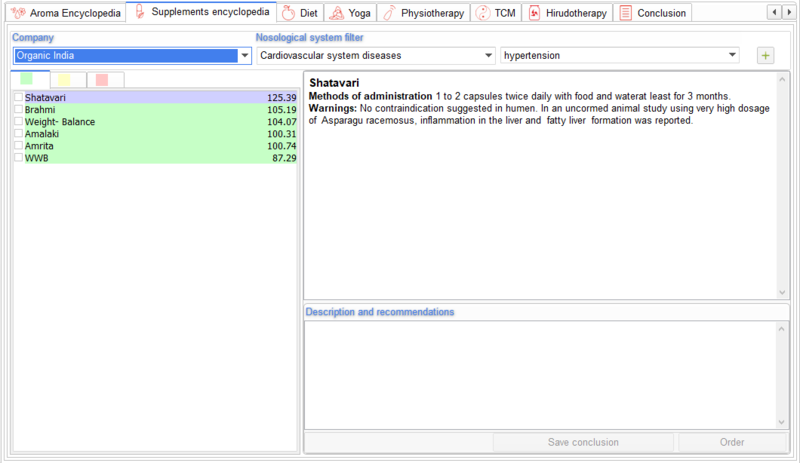 Users of the VedaPulse® software now have an option of generating recommendations on the basis of classic recipes of Churnas in the Ayurvedic tradition using the module Supplements Encyclopedia. Organic India is one of the leading companies in the production of Ayurvedic products in India, which aims to be a reliable and innovative world leader in the field of “True Wellness”. Advanced processing methods and drying technologies ensure that the herbs in Organic India products retain the maximum level of nutrients and are non-toxic and do not contain heavy metals. The company Puro Foodsupplements is the only Dutch manufacturer of natural food supplements and has been on the market for more than 10 years. The range of products of Puro is fully encapsulated and only active ingredients in a vegetarian capsule are used. All recipes are based on research and created in collaboration with the Academy of biological medicine. All herbs are of biological origin and meet the most stringent quality requirements. The ingredients used are thoroughly researched and scientifically substantiated, hence their effects are proven. The update allows to fill in the Specialist Card to have the detailed contact information about the VedaPulse® user displayed in all the reports, generated by the software, which is an additional promotive component for the services offered. To fill in the Specialist Card, go to the “Settings – Specialist Card” tab menu.